Yonatan dedicates this gorgeous song to the Alin Rehabilitation Hospital where his daughter Rivki was a patient for two years following a traumatic brain injury that left her near death. When Rivki was first hospitalized in April 2010, it appeared that Rivki would, at worst, spend the rest of her life in a coma, or, at best, be severely physically and mentally handicapped for the rest of her life. But, B”H, we in Nachlaot have witnessed tremendous miracles. Today Rivki is a happy, healthy, adorable 1st grader who nobody would ever guess was on 100s of prayer lists around the world just two years ago. This week, I know that all of us JewishMOMs are starving for a bit of good news. So I decided to take us on a journey back two and a half years to the despair following Rivki’s accident. Until this morning, I hadn’t looked at these posts since I wrote them, and, oy, how they made me cry. I was planning to spend this morning with my kids at the playground, distracting them until our annual Independence Day Barbecue in Sacher Park late this afternoon. Terrible news. The oldest daughter of Yael and singer Yonatan Razel (whose hit song “Hee She’amda” I posted right before Pesach) fell last night from the porch of their home while the family was watching Independence Day fireworks. 4-year-old Rivki Razel is now hospitalized at Hadassah Hospital in critical condition, and desperately in need of our prayers. If you are like me, you receive a bunch of requests to pray for injured or sick people every week. Maybe you tend to ignore these requests. But this is a girl who isn’t just a name. She is the beloved daughter of the person whose music has inspired you and Jews all over the world. She is also one of my 5-year-old daughter Moriah’s dearest friends. The Razels are an extremely special family. Rivki’s mother, Yael, comes as close as I have ever seen to the ideal of human goodness. I have known her for years, and I cannot recall having ever heard a negative word coming out of her mouth, about anything or anyone. If I pick up the phone and it is Yael Razel calling, I know for sure that it is because she is calling regarding a mitzvah–organizing a new playground for the neighborhood children, organizing Psalms for someone who is sick, planning meals for a sister-in-law who just gave birth. For the last few years, Rivki’s father Yonatan has dedicated half his day to Torah study at a local yeshiva, and his remaining time to creating and performing music that manages on a nearly unprecedented scale to bring Israelis, secular and religious alike, closer to their Creator. And Rivki herself? What a good girl, a special girl. I will never forget how one day at the beginning of the year my Moriah was upset in nursery school, and the next day Rivki decided to bring Moriah a chocolate bar to cheer Moriah up (it did). And that’s the kind of girl she is– a striking mixture of her tsaddekes of a mother and her tremendously creative and dynamic father. After my last mailing about Rivka bat Yael Razel, I was flooded with Emails from mothers all over the world saying that they were praying for little Rivki and requesting updates about her condition. I apologize that it will be hard for me to answer every Email personally, but as of today Rivki’s doctors at Hadassah Hospital’s ICU are hesitantly optimistic. Rivki is currently being kept in a medically-induced coma for several days in order to enable her brain optimal healing for the long road to recovery ahead, but this morning her doctors allowed Rivki to partially exit the coma in order to check her condition, and thank G-d she began moving a little bit– which is a hopeful sign. This all means that Rivki’s condition is stabilizing but she is still in critical condition. These early days are critical for Rivki’s long-term prognosis, and the parents are begging us to continue praying every day for RIVKA BAT YAEL. I have to say that I have rarely seen such a tremendous outpouring of concern and prayer for a sick person. Yesterday I sent all of my girls with Rivki’s name to add to their class’ list of people in need of prayer, but by the time my girls got to school Rivki’s name had already been written on every single board in the school by girls who had heard about Rivki’s accident on the radio and from the newspaper! In the merit of all these sincere prayers, May G-d bless little Rivki with a speedy and complete recovery! This morning I turned the corner on my way home from Moriah’s nursery school, and I began to cry. And then a lead weight flew out of nowhere directly onto my lungs. Hyperventilation, call the ambulance! Mother freaking out here. A mother crossing the street through the middle of rush hour traffic, finally feeling the full weight of this surreal and tragic week. This past Tuesday morning I woke up and my top concern was how I was going to get through that long school-less day with my bored, fighting kids, but by 9 AM that didn’t even rank in my top 100 worries. By 8 AM I had heard that Moriah’s good friend and nursery school classmate Rivki Razel was in critical condition in Hadassah Hospital following a freak accident. I keep on thinking that the greatest blessing in life and also the one that we tend to take for granted more than any other in the world is the unsurpassed blessing of a boring day. Today, how I long for a boring Thursday morning, like last Thursday morning, when I dropped Moriah off at the Rachel v’Leah Nursery School with its 26 healthy little girls watching the new goldfish and doing puzzles and looking at books in the reading corner, and then had my weekly post-drop-off chat with Rivki Razel’s grandmother about our Shabbat plans as we walked together up Betsalel Street. The miracle of a boring day. The miracle of rolling out of bed in the morning able to breathe, able to speak, able to walk. The miracle of a sturdy house with four standing walls. And the incomparable miracle of a bunch of healthy children to dress, feed cornflakes to, and to greet when they walk in through the door and throw their backpacks for the thousandth time plop into the middle of the front hall that afternoon. Please G-d, please G-d, bless me and all of us Jewish moms with the miracle of boring days, and the wisdom to appreciate them when we have them, and not just when they’ve slipped away. Thank you to all of you holy moms for your ongoing concern and prayers for 4-year-old Rivka bat Yael Razel, who is still in Intensive Care following her accident last week. For all of you who have requested updates on Rivki’s condition: this has been a rollercoaster week for Rivki and her parents (whom we should also keep in our prayers, Yael bat Chava and Yonatan Adi ben Rachel, that they should be blessed with strength and faith during this incredibly challenging time). After doctors released Rivki from her medically-induced coma on Sunday, her condition improved somewhat. But yesterday Rivki required emergency brain surgery yet again. Thank G-d, as of this morning her condition had stabilized, and her doctors are generally optimistic about her long-term prognosis. This whole week since Rivki Razel’s accident, my husband and I have been trying to figure out why we feel like we’ve been here before. Why we feel like we’ve feared these same fears, experienced this same obsessive concern, and fought this same exact battle with despair that comes when a neighborhood child is in the ICU. And I realized yesterday that we feel like we’ve been here before, because we have been. We’ve been here a few times, in fact, and the reason we don’t clearly remember that we were ever here is because we have seen miracles with those hospitalized children. 8 years ago, Yedidya Witt was in a coma after he fell 3 stories at his junior high school, and people around the world prayed and prayed that he should live and recover. And today Yedidya is a devoted husband, father, and gifted rabbinical student with no remaining traces of the terrible ordeal he experienced. 9 years ago, at the age of 2 weeks, Eden Sasson was also fighting for her life on account of a rare and devastating heart defect. But after a week in a coma, 8 hours of delicate heart surgery, and again, prayers recited all over the world for her survival and good health, Eden experienced a complete recovery, and today she is a 100% healthy, bright, and adorable 3rd grader. Yesterday I ran into Eden’s mother, Shuvi, and we were talking, of course, about Rivki. Any updates? Any news? And then Shuvi reminded me of a conversation that I didn’t remember we ever had from nine years ago. My teacher, Rabbanit Yemima Mizrachi, gave little Rivki a beautiful blessing last week. She said that a person’s name, and especially a name from the Torah, shapes who they are. And just like little Rivki Razel, our mother Rebecca, Rivka Imenu, was the only character in the whole Torah to fall. She fell from her camel when she saw her intended husband, Isaac. What a scary moment! But Rivka Imenu rose up from that difficult fall, and she thrived and grew up to become one of the greatest women in Jewish history, a matriarch who established the entire Jewish nation. In the merit of all the prayers being said all over the world for little Rivka bat Yael Razel, may Rivki soon also rise up in complete health with a miraculous recovery. Amen! B”H, we in Nachlaot have witnessed great miracles. In the end, Rivki did “rise up.” Today she is today a happy, healthy 1st grader who you would never guess was near death just two years ago. The head physical therapist from Alin told Rivki’s mother that she has never witnessed such a quick and complete recovery after such a severe head injury. I was researching Rabbanit Mizrachi who will be speaking at a Project Inspire conference next year and discovered your blog. I’ve played “He Sheamda” so often in my car that I fear the CD will wear out! 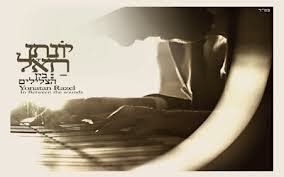 How great to find out that Yonatan Razel has recorded a new CD but even more so to hear about his daughter’s miraculous recovery. I’m so glad you wrote this article, because I’ve been davening for the refuah of Rivka since the plea first went out a couple of years ago (came in an email from someone I didn’t know). I didn’t know who to contact about whether to continue praying for her refuah, so I just kept her on my list. I am so delighted to learn that the Raziels’ daughter is in school and functioning normally. Thank you Hashem and thank you, Chana, for posting. How great is our Shephard,our Creator,HaShem for these Miracles.A lot of blessings for this family Razel. Thank you very much for this post! It is very encouraging to hear about wonderful miracles performed by our Great,Vivacity Ha’SHEM Baruch Ha’Shem for Yonatan Razel’s family and his music is an enormous comfort and support!